The martyr’s grave is the foundation of the Imperium! Commissar Jemadar drives the team back through the desert against fierce sand storms and massive flocks of shale crows. They reach Stern Hope at dusk, to find the gates open and unguarded. Teniente Hernandez jumps out and checks the approaches, finds the dead bodies of the guards. They plow through the shantytown with the truck to move faster, find multiple dead bodies. As they pass the priory, they see more bodies piled up in front, left by a terrible battle. Xanthia notices movement and shouts at Calpurnia to stop. Xanthia and Hernandez jump out to go check, find Brother Lamarck, dying. He clearly fought attackers until his lasgun batteries ran out, then continued fighting using the lasgun as a club, until he was overwhelmed. He whispers to Xanthia, begging her to save his flock, trapped at the cathedral. He proclaims his faith in the Emperor, then dies. As they reach the base of the cathedral, it's darker than it should be, and a sickly glow is coming from the door. Calpurnia tells everyone to disembark, then runs the truck up the steps and through the cathedral doors, smashing into a column! They find the people of Stern Hope held terrified, weeping blood, forced to sing a hideous chant. Quaesitor Aristarchus is floating in the center of the cathedral, surrounded by the cards of the Imperial Tarot. A hole into utter, inchoate blackness has opened above. The mere view of this black horror causes boils to erupt on Aenid's skin and leaves Calpurnia feeling weak. Xanthia launches a psychic bolt to take out Aristarchus, since he seems central to the ritual, but the cards absorb all attacks, energy bolts, psychic energy, etc. aimed at him. Aenid and Calpurnia notice that Aristarchus is saying something, not in time with the chanting. In the shadows behind him is the misshapen silhouette of Abbot Skae, hunched over the altar. He chuckles at their arrival, claims he is a god and about to regain his physical shell thanks to two fools driven by ambition and pride. Aenid Fraal and Rollando Hernandez shoot at the creature who was formerly Abbot Skae, slightly slowing him down but without wounding him despite hitting dead-on. Calpurnia Jemadar turns to Quaesitor Aristarchus to hear his words, hoping to get some help from him. He seems enraptured and keeps repeating: "The Saint is reborn!" Xanthia asks Cherubiel for help but he reminds her that she said she didn't need him, and he wishes her good luck. Xanthia remembers the tale of the Crow Father told by Death Singer Esha Raine and shouts at her companions: "The tales said that the only thing the Crow Father feared was the agony he most loved to inflict… Aim for his eyes!" Deciding that she is not likely to make the shot from where she is, Calpurnia charges into melee to strike at the former abbot with her combat knife, forcing him to take a nasty cut on his arm that leaves him unwounded but shred part of his fleshly envelope. Aenid joins in, then Hernandez, as Xanthia continue s to blast bolts at the enemy until she is drained, then continues with her laspistol. Hernandez strikes successfully and takes out one of Skae's eyes, causing terrible pain but also terrible retribution. Jemadar, Fraal, and especially Hernandez suffer more wounds as they trade blows with the creature, and hack away until its shape is nothing but a darkness in man-form. But another lucky blow from Teniente Hernandez takes out the Crow Father's other eye and banishes him. The darkness explodes, Aristarchus is blown out of the cathedral, the tarot cards burst into flames, and the roof is destroyed; debris rains on the crowd. Hernandez is at death's door. Xanthia asks Cherubiel to help her save Rollando; Cherubiel consents — in exchange for a favour to be named later. Hernandez' own stamina and Xanthia's ministrations save the ex-Guardsman's life. Outside, they find the mummified body of Quaesitor Aristarchus, still holding a tarot card. But they see that the card is not paper, but very thin machinery. When they try to pry it from Aristarchus's dead hand, his body falls to dust. The card is that of the Emperor; examining it, Xanthia can tell it is of xenos origin. They also find, in the ruins of the Guest House, the remnants of the Quaesitor's data slate; the last entry, when recovered, speaks of his joy at seeing Saint Drusus himself appear to him in the cathedral and at being able to help the saint be reborn. A call to Port Suffering obtains no help. They send one of the less damaged townsfolk to get help from Warlord Kos'ke, who brings Esha Raine. 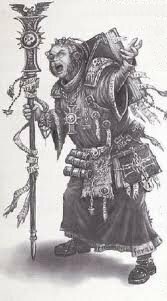 The warlord takes the town under his protection for the moment and promises to try to rebuild the cathedral, but ask that they send more help from the Ecclesiarchy. A few days later, as the acolytes are getting ready to return to Port Suffering, Esha Raine present Teniente Hernandez with the weapons, insignia, etc. of Brother Lamarck, asking him to make sure he receives the honours he deserved. She also promises that Brother Lamarck will be honoured here and so will the acolytes, although she understand that the latter must remain nameless and discreet. Warlord Kos'ke has the acolytes taken back to Port Suffering, where they report to the chartist vessel Misericord. There, in the loading bay, Calpurnia Jemadar recognizes the uniforms of a group of troops from the Chaliced Commissariat!